Until this year, things were looking up for the new generation of banks trying to make their way in Britain's notoriously tough banking market. But the woes of TSB have raised a question mark over their future.The financial crisis massively reduced the choices available to British customers, as weaker banks and building societies were forced to merge with stronger rivals. By 2011, the biggest four banks had more than three-quarters of all current accounts. The answer was to promote the growth a new generation of smaller, more varied, more competitive institutions giving customers more options for handling their money - and to reduce the risk of too-big-to-fail banks that the government might one day have to rescue again.So the regulations changed and new names appeared on the High Street, online and, crucially, on mobile phone apps. They are a diverse bunch: some like TSB were spun off from bigger banks, deliberately marketing themselves as ready to take on the old industry "fat cats". Metro Bank opened its seven-day-a-week service in 2010 - the first new independent UK High Street bank in over 100 years. Others, like Wyelands, ClearBank, or Secure Trust Bank offered specialised banking services, while start-ups such as Atom, Tandem or Monzo offered pure digital platforms.Low interest rates, economic growth and a healthy property market were fertile ground for the newcomers.Last year, accountants PwC estimated that they employed 35,000 staff and served some 20 million customers. But the financial sands have been shifting. TSB managed to stand alone for a year before being taken over by Sabadell of Spain, and has since been struggling to contain the fallout from a botched attempt to move customers onto a new IT system. Nicky Morgan MP, chair of the Treasury Select Committee which cross-examined its chief executive Paul Pester, called TSB a "broken bank".There is a growing expectation that the sector is about to be hit by a wave of take-overs. Last year Shawbrook was bought out for around All the same, life for the challengers has become more challenging. Three months ago the Bank of England turned off a financial tap that the credit ratings agency Moody's estimates saves British banks some ?800m a year in interest payments. The Term Funding Scheme (TFS) was set up to support bank lending immediately after the 2016 referendum. It offered cheap money - on the condition that the bank lent the money on to customers.According to the Bank of England ?127bn has been lent to banks and building societies over the last two years with rock bottom interest rates, close to the base rate.More than 60 financial institutions took advantage of it. Virgin Money was one of the biggest borrowers among the challenger banks, receiving ?6.4bn.Now the tap has been turned off, and funding is getting more expensive at a time when challengers are facing weaker economic growth and tough competition. To replace the TFS the banks are going to have to harvest depositors by putting up their savings rate - good for savers but tough for the banks.Craig Donaldson, chief executive of Metro Bank, says he has already seen an increase in deposit rates online but insists it won't affect Metro: "We win customers largely on service and convenience. If you want the best rate it will be somewhere online. But last year we grew our deposits by ?1bn - we want our customers for the long term. "However, as the banks change so do the customers. PwC and YouGov last year surveyed 2,000 UK consumers and found that over half (54%) would prefer to use a number of banks, having a mortgage here, a deposit account there, and a business account somewhere else.And for those people life is becoming easier. Since the beginning of the year open banking has arrived in the UK. This should allow customers to share their financial data securely with anyone they choose, allowing them to compare banks' products faster and more safely than ever before.Mr Lyons, explains how the new financial landscape will suit the digital banks: "These banks are still very small - typically having fewer than 150 employees and, for those that are active, fewer than 100,000 users. 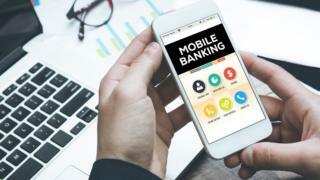 "They are positioning themselves to lead in the forthcoming era of open banking - which will require specific banks to share specific data securely through open [application programming interfaces] - the technological tools that will deliver this change. "Some of the newcomers are already winning thousands of new customers a week without even being fully fledged banks, raising money from investors and offering cheap but limited financial services. Revolut, for instance, offers a current account service which allows you to make and receive payments, withdraw money from cash machines, and transfer money abroad. It can't call itself a bank, as it doesn't have a banking licence, though it is now applying for one. According to founder Nikolay Storonsky, it is adding 6-8,000 accounts every day: "As we are not a bank we cannot use clients' money. "At the moment with two million or so customers across Europe we are not real competition to the big banks, which have 20-30 million customers. But we offer free services and we provide better products. "Revolut raised ?179m from investors, valuing the company at ?1.3bn, achieving the status of a tech "unicorn" - a private start-up valued at more than $1bn (?740m). So there's no shortage of funding for bright banking ideas which will continue to change the way we bank. A big boost for the challengers is on its way from an unlikely source - RBS. In exchange for receiving state aid during the financial crisis it did a deal with the European Commission and the government, called the alternative remedies package (ARP). The ARP amounts to some ?800m, to be earmarked for increasing competition in the banking sector. Some of this is for banks to invest in business banking services, while the rest will be for funding incentives for customers to switch banks. Mr Donaldson of Metro Bank thinks it could be a game changer. Metro is applying for ?120m of the funds. "It could make a fundamental difference, and there is enormous responsibility on the committee deciding who will receive the funds. "At the moment we are opening 100 new business accounts a week. If we get this money we will spread it out across the UK. We will spend every penny on creating competition and jobs."